Striking blows with the knuckles of a closed fist are common to many combat sports and martial arts, and of these disciplines, boxing is the most studied. 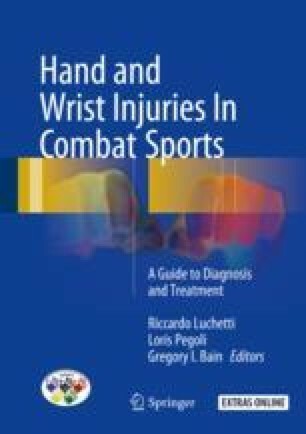 Given the nature of boxing, the hands in particular are vulnerable to both acute and chronic repetitive injuries. Tremendous forces can be generated, particularly in the rear hand. Smith et al. recorded just over 2000 N of force generated by a rear hand punch in novices, and this rose to almost 5000 N in elite professionals . The force generated is transmitted across the hand, and the majority of the force is transmitted through the index and middle metacarpals. It has been reported that the index and middle metacarpals transmit 33% of the force while the ring and little metacarpal only 15–20% . As a result, the most commonly affected carpometacarpal joints (CMCJ) affected are those of the index and middle fingers [3, 4].